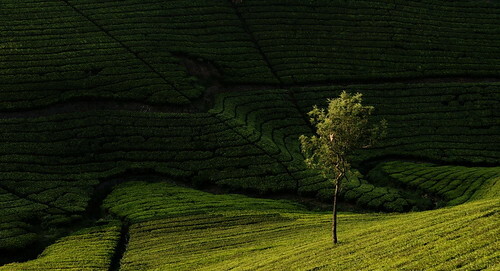 Tree, Tea : as the sun started to disappear behind the mountains, this lone tree stood out in the tea gardens, as if trying to catch the last of the rays; Coonoor, Tamil Nadu. Coonoor is definitely less crowded than its more famous neighbour Ooty but the town itself can seem like a busy place when you are trying to get away from the rush. Get a little out of town and leave the main road far behind and already you can hear the flow of the wind and the twittering of the birds, in the midst of green tea gardens; in this is Sans Souci. A simple place to stay in with simple food but still worth the time spent there. A single bus winds its way from Coonoor and passes by to the last stop to one more tea estate. We catch this bus and take a short walk to Echo Rock. It is obvious what the rock does but it also offers a good view down the steep valley to the forests below and the backwaters of a dam. We come back to the bus stop and take another road which goes to a village of the Toda tribe. Another village on the way is inhabited by the people working in the tea estates and preparations seem to underway at the small temple by the road for a celebration; one of the kids playing there asks me in English whether I am a foreigner, intent on using what he is learning at a school in Coonoor, he is neither happy nor disappointed when I tell him I am from Bangalore. The Toda tribe still lives there but in modern small houses; all that is left from their history is a temple with a smallest door to be seen on any building. No one other than the tribe people are allowed near or inside the temple and it seems to have not been used for some time. Taking another road back, we pass a group of men busy in the tea gardens, picking leaves using an instrument that makes it easier for them. Further along the road in a small village bags full of tea leaves are being accounted for, the collection for the day being calculated before being sent to the nearby tea factory. There are a few kids on cycles, walking up with their cycles and then going down at full speed: simple fun. Our overnight return bus was from Ooty and catching the last train for the day from Coonoor to Ooty would have been too early for us; a train passed us next to the main road in Coonoor, we watched it go by whistling steam and hurling pieces of coal. We were in no hurry to get to Ooty and hence went to the train station after the last train had left and spent some time sitting on the empty benches in the train station, as if waiting for a train that was not to come that day. PS: All the photos in this set are in the 1.85:1 ratio, composed as such. "All the photos in this set are in the 1.85:1 ratio, composed as such"
Do you mean you intentionally cropped with this ratio ? Any idea behind it ? I personally am a big fan of 16:9s i simply love the landscape perspectives in that. Yes, composed the shots taking into account only the middle half of the frame using the frame lines in the camera as an approximation; later cropped to the same. Just trying out a cinema ratio to see how different it is to compose with that ratio. 1.85:1 is just slightly wider than 16:9. Beautiful photos. Can't say I noticed the aspect ratio till I read your post. Your metering and exposure is so good. Thanks thaths. Frankly I expect the matrix metering in the camera to do its job in most cases, accepting whatever settings it gives and just clicking. Reached here from Arun's blog. Think I've been here before. What a set of fabulous pictures! My fav is the 5th in first column. Sitting at my desk here, I can feel the wave!